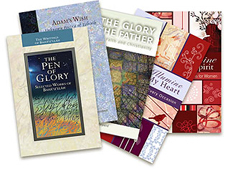 Our sacred writings are available to everybody. We view these texts as divinely inspired. The original manuscripts of Bahá'u'lláh’s writings - some written in His own hand and others meticulously transcribed by His personal secretaries - are today kept at the Bahá'í World Centre in Haifa, Israel. Some are mystical works in lofty and beautiful prose, and others are direct statements on morality and ethics. There are scriptures on spiritual and social teachings, prayers, letters and poetic works. Bahá'u'lláh’s main works are now available in most of the world's major languages. Selections have been translated into more than 800 tongues and translations are ongoing. The book of the laws and institutions that Bahá'u'lláh prescribed for a future world civilisation. A collection of letters that Bahá'u'lláh wrote to the world leaders of His time. A compilation of representative passages on a wide variety of subjects. A compilation of prayers and texts for meditation. A collection of spiritual maxims. Bahá'u'lláh's principal doctrinal work, which explains the concept of the oneness of religion, the symbolic use of language in the sacred books, and Divine purpose in human history. The best known of Bahá'u'lláh's mystical writings. In addition to the writings of Bahá'u'lláh, Bahá'ís also recognize as divine scripture the writings of His Herald, the Báb. Some of these writings have been translated and published in Selections from the Writings of the Báb. Authoritative interpretations of the sacred texts by Bahá'u'lláh and the Báb can be found in the very accessible works of Bahá'u'lláh’s appointed successor, 'Abdu’l-Bahá. Authoritative interpretations also can be found in the works of 'Abdul-Bahá’s successor, Shoghi Effendi. Inspiring prayers are available for use by everybody to enable us to develop and grow closer to God. For example there are prayers for assistance with difficulties, and for children and youth, the departed, healing, humanity, marriage, praise and gratitude, protection, and spiritual qualities. The prayers are by Bahá'u'lláh, the Báb and 'Abdu’l-Bahá. Here are some examples of Bahá'í prayers. O my God! Unite the hearts of Thy servants, and reveal to them Thy great purpose. May they follow Thy commandments and abide in Thy law. Help them, O God, in their endeavour, and grant them strength to serve Thee. O God! Leave them not to themselves but guide their steps by the light of Thy knowledge and cheer their hearts by Thy love. Verily, Thou art their Helper and their Lord.